Lunch time on weekdays often means a quick lunch and a long coffee break to me. That is when I eat the lunch that I bring from home at the office and after that go to the park downstairs in my office building area. Then I sit. And I read books. And I watch people pass by. Last week I sat down at the usual coffee place and I looked around. Then it dawned to me. I could not have a better office building. Or even a better job. For this particular time in life. I have a job in which I feel like I know what I am doing — I have been doing more or less the same thing for the past eight years. I can go home at 5pm. I get along with my colleagues (hopefully it goes both ways). I can expand my network. And this. 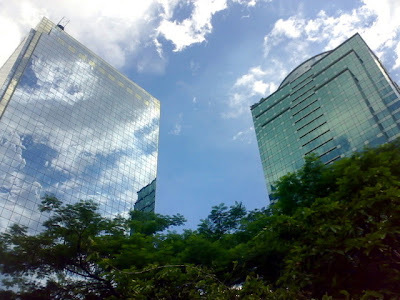 The office building with a park and a coffee place with outside seats. I have said this many times, and I will say it again. Thank you. Appreciate all the things that you have done for me. This entry was posted in personal on March 21, 2007 by Eva. Or rather, in my case, a driving meditation. It was a late Sunday afternoon. I just had lunch with friends, and coffee with another. We parted. But I did not feel like going home. Not like there was anything wrong with home. It was just one of those times. When you just want to wonder around with nothing but your thoughts. Your mind remains quiet. Your mouth as well. Too tired to move. So I drove around town. And I was treated with a beautiful sunset. Typical sunset in a big city. Still it was beatiful. And managed to bring a smile to my face. Nice. I don’t mind you as my company. It was a public holiday in Indonesia. People were rushing out of town. So what did we do? 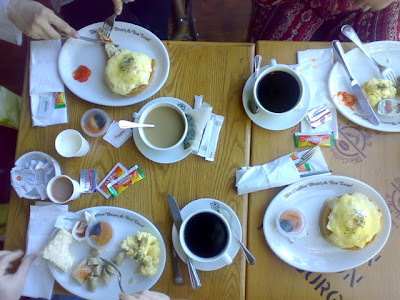 Mom, sis, bro and I went for a relaxing breakfast in a nearby cafe. Relaxed. Happy. Warm. Feels so close. Llike a family. Thank you. This entry was posted in family on March 21, 2007 by Eva. Communications Liaison to BRR Office of Economic Development (OED). Short term. Based in Aceh. Working under the the Aceh Technical Assistance Recovery Project (A-TARP), this advisor will provide a range of technical assistance in communicatons to OED and its initiatives, including the Investors Outreach Office (IOO), Export Development Center (EDC) and Economic Development Task Force. Five years of experience is a must. If you are interested and you think you would be qualified, please email me for details. A job opening – long-term public affairs, communications, and public relations advisor to provide support to Indonesia’s Ministry of Trade in capacity building, public outreach and awareness, and communication. Based in Jakarta. At least five years of experience in communications is required. 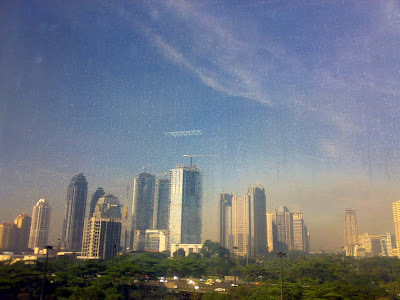 Jakarta is sunny today. It was sunny yeterday morning and part of the afternoon as well. I was waiting for my car, half complaining and thinking what had taken my driver so long to come. 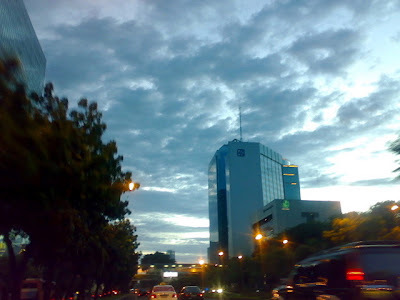 And I was looking towards the sky of East Jakarta. I literally watched the storm moving towards me. It was so fast. 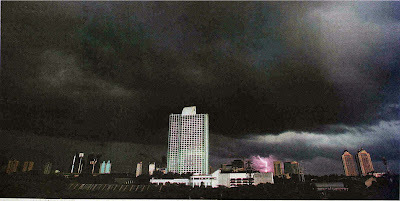 The bright sky quickly turned into dark. Very dark. And might I say, scarily dark. As I was on my way home, I thought probably it was no coincidence that I should stand there watching these drastic changes of the sky. The waiting for the car was just a logical excuse to force me to stand there, having no other choice but to watch the sky. From brightness to darkness. Just like I am standing here right now watching my country. This entry was posted in occasion on March 15, 2007 by Eva.